BigUpRadio.com proudly presents the weekly reggae dancehall radio show called "Green Lion Radio Show." Hosted by DJ and producer Zeke Stern, the Green Lion Reggae show features speciality programming in which Stern curates the program based around a unique theme, exclusive pre-releases from the Green Lion catalogue, one on one interviews and Green Lion's signature 'LP Clash' where seminal albums in the history of the music face off and the listener can decide who wins. 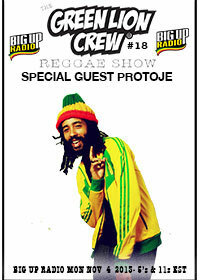 This week we have the words, sound, and power of Protoje on the show. Hear tracks from his last two albums, an exclusive interview and which artist he must have in his dubbox as a sound man! An hour of music from Protoje and friends. Catch the Green Lion Reggae Show every Monday on the dancehall station at bigupradio.com. The show times on Mondays are: 5am, 11am, 5pm and 11pm Eastern Standard Time. The Green Lion Reggae Show, keeping you up to the time and close to the roots. Born in the 80’s but wishing he was birthed in the 60’s, Protoje (Oje Ollivierre) is the fresh face with the freshest lyrical delivery, still having a feel of vintage reggae music but being a suitable update for the present time. Indeed, Marley’s mantra was to “free the people with music.” Protoje’s mantra is to free the people with art. Music – his appointed contribution to the artistic revolution – is only one of the many distinct art forms. He takes up the mantle of spokesperson for the Movement and represents the evident unity among a large group of talented musical, literary and visual artists who have silently and patiently developed under the radar and are about to march together into a new era of prosperity for all. Zeke Stern, aka Green Lion, is a deejay, producer and radio host based in New England USA as well as co-founder (with Dana ‘Chai’ Knowles) of theGreen Lion Crew sound system. Stern’s credits include the underground crossover hit “Come Down” performed by Collie Buddz included on the Playback EP as well as the More Spiritual Riddim featuring Kabaka Pyramid, Mr Williamz, Million Stylez, YT, and Perfect.